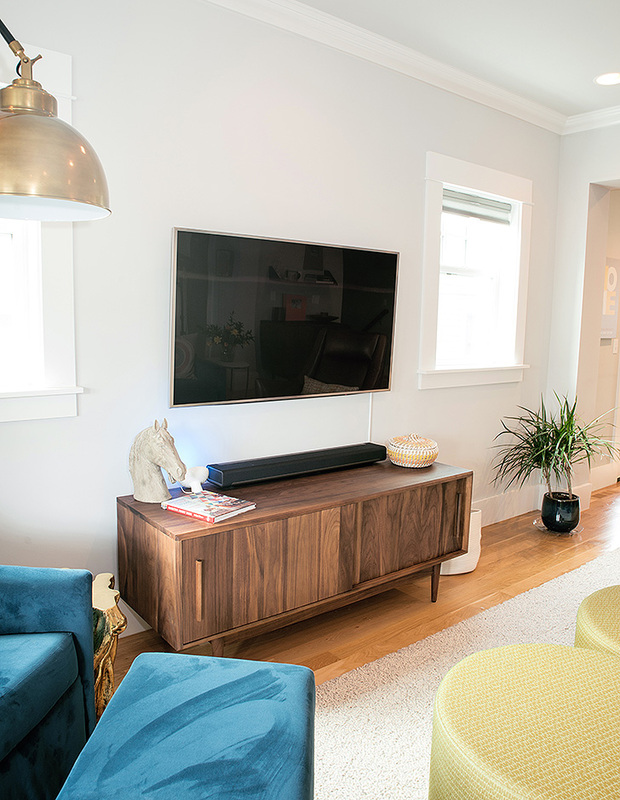 As the couple debated whether to hire an interior designer to help them, Kristina showed Andy the Room & Board catalog and suggested they visit the Seattle showroom to look at some of the products. Andy was initially resistant, worried that Room & Board’s style was “too modern or too monochromatic” and that the family didn’t really fit either bucket. “When we went into the store, Andy said it felt really good,” said Kristina. While shopping, the couple met Design Associate Elaine Thompson and immediately hit it off with her. Seeing the space come together has been a joy. “The delivery guys were so wonderful. 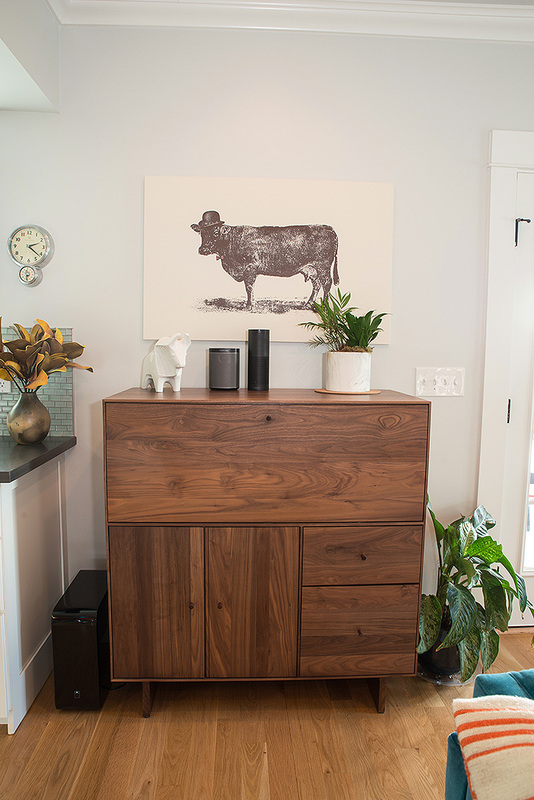 They’re an extension of everything else that is so great about Room & Board,” reported Kristina. “They put everything in place.” The family is enjoying their new space—and stay in touch with Elaine. “Being new to the city, we didn’t know any babysitters,” said Kristina. “Elaine put us in touch with her daughter, and now she babysits our kids!” How’s that for full service? 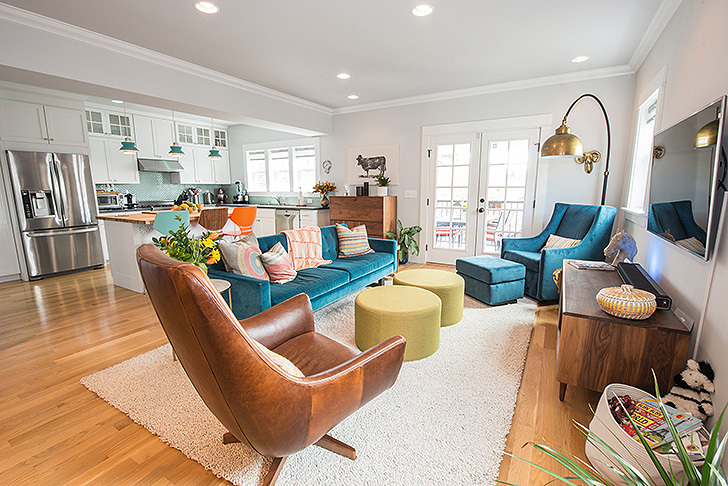 Tour the Simpsons bright and cheerful home below and learn some design tips along the way. Looking for help with your own home? Learn about our free design services for projects big or small. The Charles leather swivel chair pulls together the neutral tones in the room and is a favorite of both Kristina and Andy. “We compete for it!” laughed Kristina. Also shown: Wells sofa, Aero ottomans, Arden wool rug. 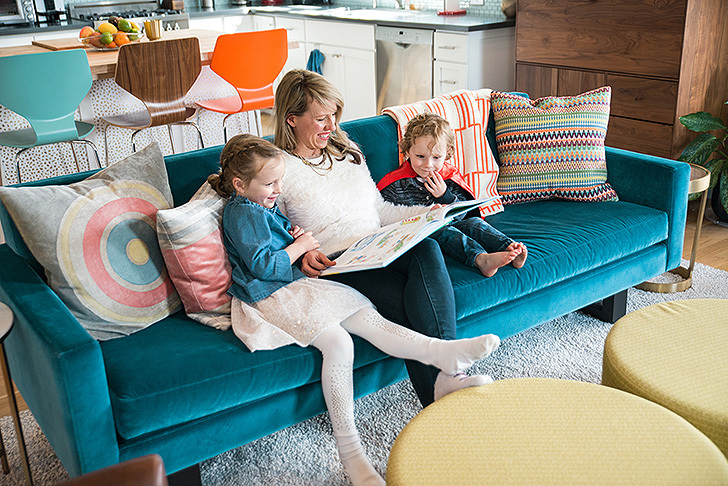 Velvet might seem a surprising choice for a family-friendly sofa, but Elaine said, “The color, sheen, and quality of this velvet allow them to live their lives without having to baby the Wells sofa.” Plus, the Vance peacock hue is a showstopper. Modern throw pillows add patterns and texture. A Grove media cabinet anchors the space under the TV and provides hidden storage. Multiple colors of the same design lend an eclectic, yet intentional, look. 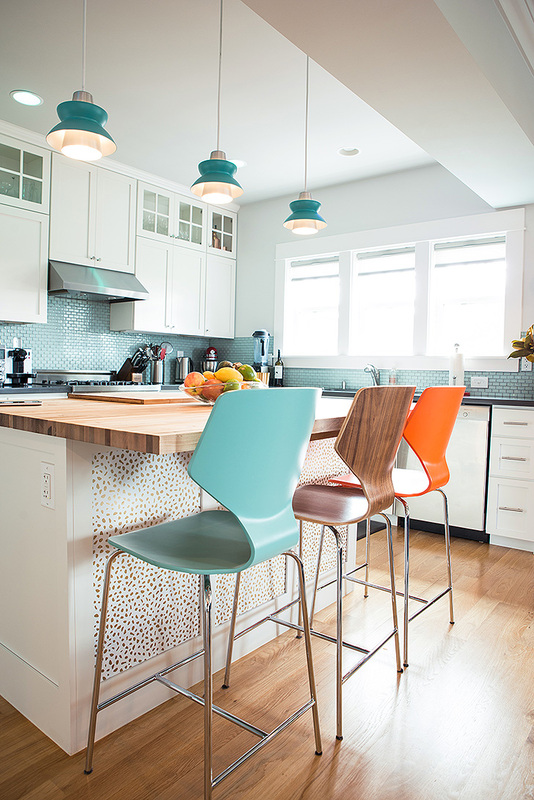 Pike counter stools play off the colors and finishes in the kitchen and adjacent seating area. “I suggested Fog quartz as the top for this Parsons table because it is easy to wipe off and simply looks great,” said Elaine. 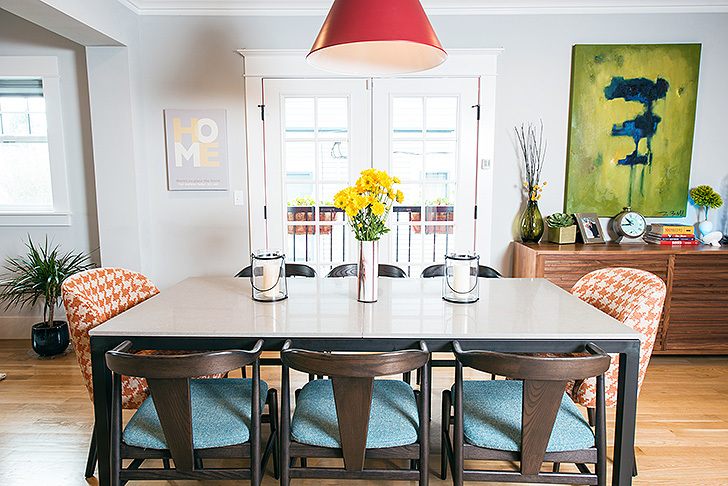 Mixing custom Cora chairs (at the ends of the table) with Evan chairs lends a collected-over-time look to the space. This Hudson office armoire features a drop-down desk and file drawers, creating an efficient, space-saving area for a laptop and other essentials. Andy’s UK origins reflect in this area of the home through art and other objects. The Chilton coffee table continues the walnut shown elsewhere in the room. 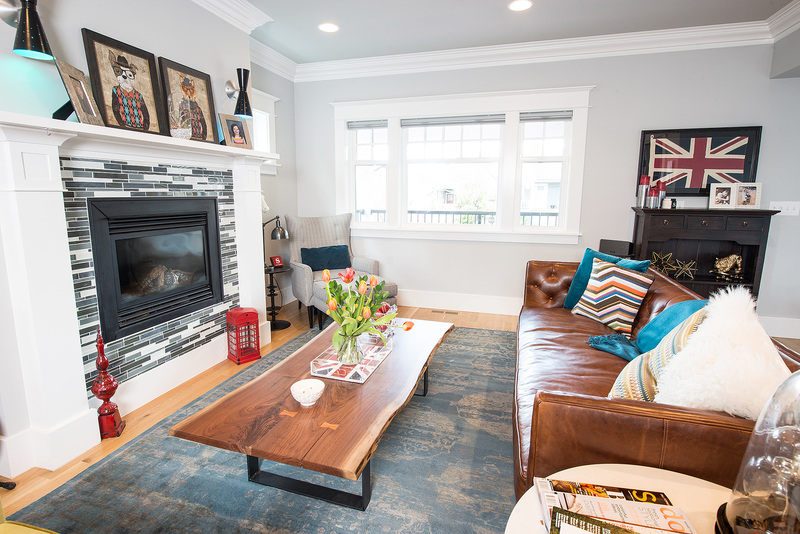 The Macalester leather sofa is an inviting space to warm up in front of the fireplace. Also shown: Sivas rug, Louis accent chair and ottoman. 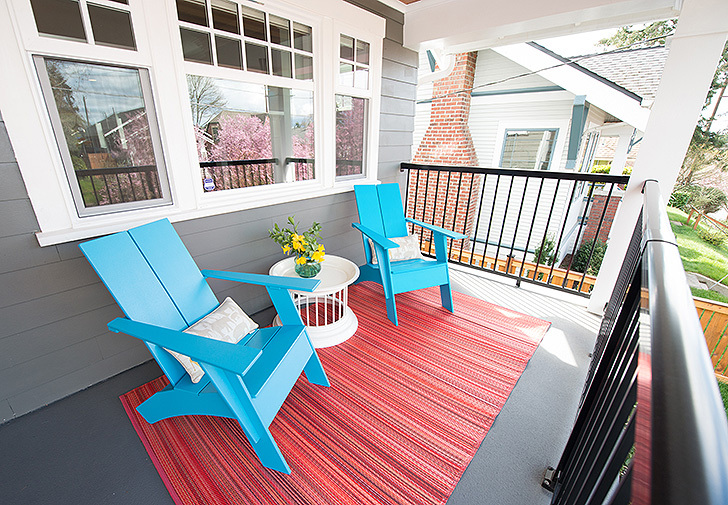 Bold Emmet chairs greet passersby from the porch and create a comfortable spot to relax.